In the late 1970s, a comedy trio created what was to become an entertainment phenomenon and a reference point in Norwegian popular culture. The Dal Brothers franchise mixed adventure, fantasy, sci-fi and comedy in a way never done before or after in the Nordic countries. In Norway, everyone knows the comedy trio KLM. 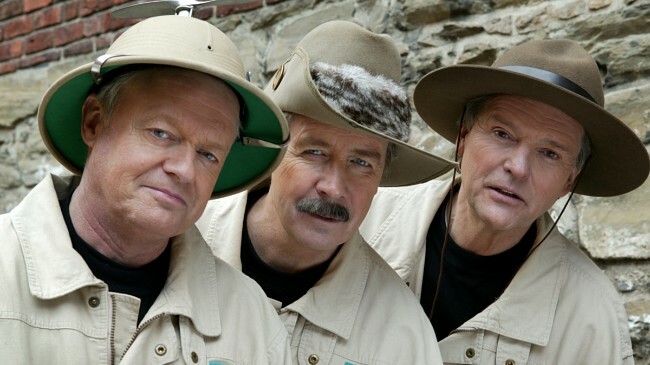 Made up of Trond Kirkvaag (who died in 2007), Knut Lystad and Lars Mjøen, the trio has entertained Norway through four decades, and with the recent release of the DVD of the Dal adventure The Curse of the Viking Sword, they embark on their fifth decade as fantasy comedians. Gaus, Roms and Brumund Dal. Photo: NRK. The KLM trio was formed in 1975 and they soon achieved great popularity as writers and performers of comedy shows, radio gags and TV miniseries. Inspired by Monty Python, the trio’s trademarks were physical slapstick and puns in a frame of satire based on current events and archetypes, always written by themselves. 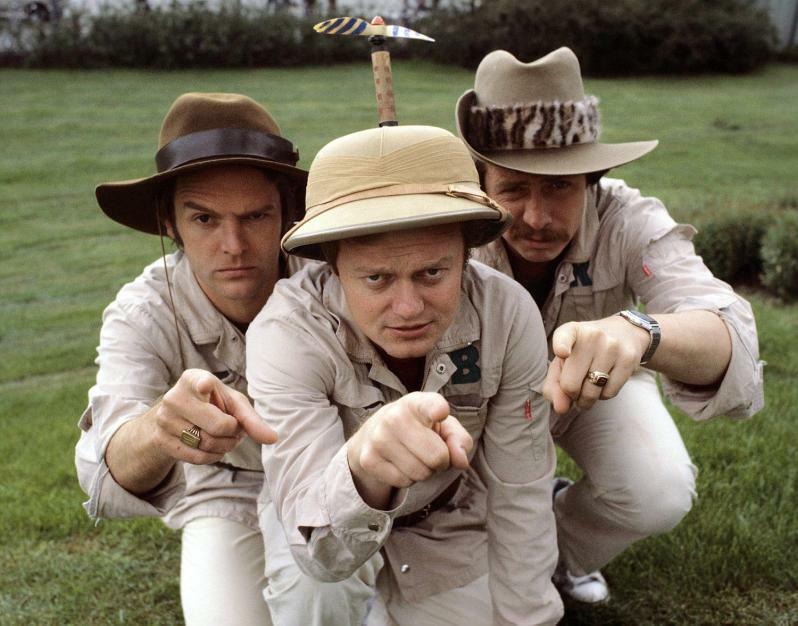 KLM are household names for their many TV sketch shows but their longest franchise is the Dal adventures; four TV miniseries produced for national broadcaster NRK between 1979 and 2005, and a stage play, in which Kirkvaag, Lystad and Mjøen played three brothers on various missions of national (and even intergalactic) interest. Random seqience from the first series. Throughout the 80s and early 90s, KLM focused on satire and sketches on TV and radio, with no particular sci-fi relations. In 1994 the third Dal series arrived on TV; The Legend of Atlant-Ice (12 episodes). This time there was no time travel but fantasy elements included were a shaman with supernatural powers, a magic potion, the lost continent of Atlantis (which the brothers attempt to find), eternal life, a magic rucksack, etc. KLM was now an established entertainment force since long and the third Dal adventure was once again well received. A few years later, in 1997 the brothers branched out and KLM created a Dal Brothers stage play, performed at a theme park outside Oslo. The Curse of the Viking Sword once again featured time travel, as well as viking magic and Norse mythology. For two weeks the musical fantasy show thrilled audiences. Apart from the confines of the stage, a new twist was that Brumund was not live on stage. The actor, Trond Kirkvaag, was ill and had recorded his appearances on video. 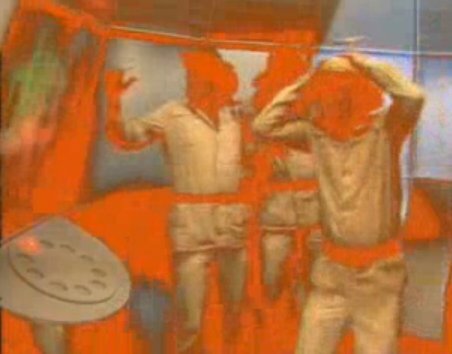 These sequences were seamlessly written into the live performance by way of a “video time telephone” device, another example of impossible sci-fi technology in a Dal adventure. The play was filmed and was edited into a theatrical feature which opened in September 2010. The DVD came out in Norway in January 2011. The fifth and most likely last Dal adventure, The mystery of Karl the 12th’s spats, came to TV in 2005 and dealt with the lost spats of Sweden’s king, Karl the 12th, who ruled a joint Sweden-Norway in the 18th century. In the Dal universe, the spats played a crucial role in the political future of Norway; if the spats were not present and counted for 100 years after Norway broke free from Sweden in 1905, Norway would revert back under Swedish rule. Again taking on the role of time travellers, the Dal brothers attempt to locate the spats and bring them back. The major sci-fi element in this series is made possible by a new invention called the time wheel, which replaces the time machine used in previous adventures. Karl the 12th’s spats, consisting of 10 episodes, is also different because each episode is 30 minutes long, double that of the previous series, but with the cliffhanger format still providing thrills. The series was concieved to coincide with the actual 100th anniversary of Norway’s independence from Sweden, which made the overall story more realistic and in a way meta-TV, which is another trademark of the Dal series. The brothers in 2005. Photo: NRK. 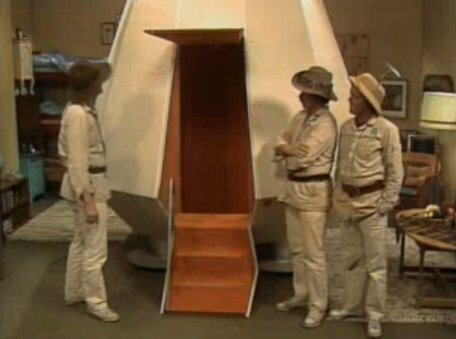 Karl the 12th’s spats is probably the final Dal adventure, as Trond Kirkvaag, who played Brumund Dal and was also one of three original creators and writers, died from cancer in 2007. It wasn’t even given that Norwegians at large would be able to enjoy Viking Sword, as the recorded material could not be used until video technology had developed far enough in the late 00s. Ideas tossed around for more Dal adventures include an amimated adventure, as well as a Young Dal Brothers series. One of the franchise’s creators and actors, Lars Mjøen, informs Nordic Fantasy of two other franchise ideas; in one series, the brothers had disappeared and The Narrator went looking for them on the river Overfloden, which was the location of the first series. Another idea, which Mjøen describes as “chatter between Knut and me at parties”, is a Dal adventure for adults which would be a satire of Heart of Darkness / Apocalypose Now and the movie Deliverance, in which a young comedian brings the old Narrator in canoe down an unknwon river, looking for two elderly comedians (Lystad and Mjøen) who lives in a creepy, remote valley together with a court of old fans who only like oldfashioned humour. In the valley there’s a grave with a cross with a propeller helmet (Brumund’s helmet). Travelling into the unknown, we get to see parodies of scenes from the book and the movies mentioned, and in the end scene an attempt is made to kill off old-style comedy and the fat old comedians who cling to it. None of these ideas are being developed, and while it is unlikely that another Dal story comes to life, Mjøen in his message to Nordic Fantasy did not categorically reject the possibility of another adventure. The time machine in “Spektral Stones”. Photo: NRK. Time travel is essential in three of the five stories. In the second series, The Spektral Stones, a time machine is built from blueprints provided by an alien in a UFO. The machine is just big enough to carry the three brothers, and is powered by a certain mineral called spektral stones; diamond-shaped fist-sized stones originating from outer space, but located on Earth. In the cliffhanger-strong series, the brothers do not know where they will find the next stone; a new stone is needed for every time jump, and they do not know where or when they’ll travel in time. In the fourth adventure, about the viking sword, the brothers are building a new time machine, but not one given to them by aliens. This time they bought one on TV shop, but as with lots of cheap gadgets bought on mail order, something goes wrong. And, once they have arrived in the Viking age, they do not travel back and forth in time as they do in the two other series featuring time travel; they stay in the Viking age until the adventure is over. In the fifth and final story, the brothers are given a new time travel gadget by a scientist friend. A rather mad scientist, in fact, who has also invented a gadget that can control the weather, but only indoors. This time they’ll timejump using a small wheel with instruments and griphandles. The major difference in time travel technology compared to previous series, is that with the time wheel the brothers can decide where they want to go, and when they want to go by programming the device depending on what task is at hand. The device is also small enough to fit into the magical rucksack, the “travel sack” (which is magical in the sense that everything fits into it, from complete meals to a piano). This quantum leap in technology might at first look like a way to reduce production costs, but is actually important to the story as the brothers need to be able to travel to specific destinations and times in order to save Norway from reverting back to Sweden. The original time machine had no controls, and seemingly randomly travelled from place to place and from time period to time period. Actual time travel taking place. Photo: NRK. According to Lars Mjøen, science fiction litterature was a huge influence on the time travel and sci-fi elements of the Dal series, as he and Knut Lystad had read quite alot of sci-fi books in their younger days. However, one time period the brothers never visited was the future. Apart from travelling back to their own time from the past, timejumps into the future did not occur in any of the series. However, when asked what KLM would have written for their Dal counterparts if they had been given unlimited amounts of money, Mjøen suggests they would have written time travel stories from the entire world history – including the future. Sketch explaining the duties and qualities of the Norwegian navy. KLM’s body of work formed a school which subsequently has been immitated by following generations, but with their Dal franchise, KLM went beyond known genres and as they created their very own format, they merged the fantastical with the bizarre while still retaining linear narration, something Flying Circus lacked. Before KLM gave us the Dal Brothers, comedy had no place in Norwegian and Scandinavian fantasy and sci-fi. In short, KLM sent laughter where no comedy had gone before. All Dal Brothers adventures are available on region 2 DVDs from most Norwegian movie retailers.